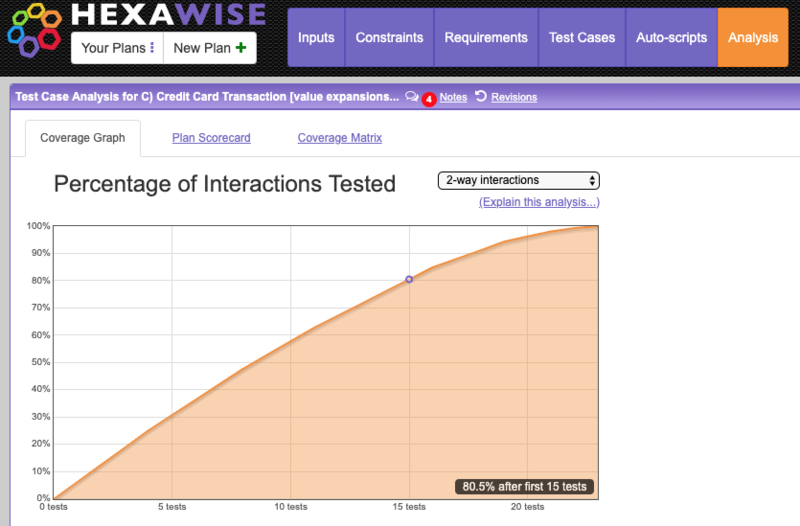 This is an overview and explanation of a set of functional tests created in the Hexawise test design tool. This plan is based on the example in Elfriede Dustin's article "Orthogonally Speaking," available here. 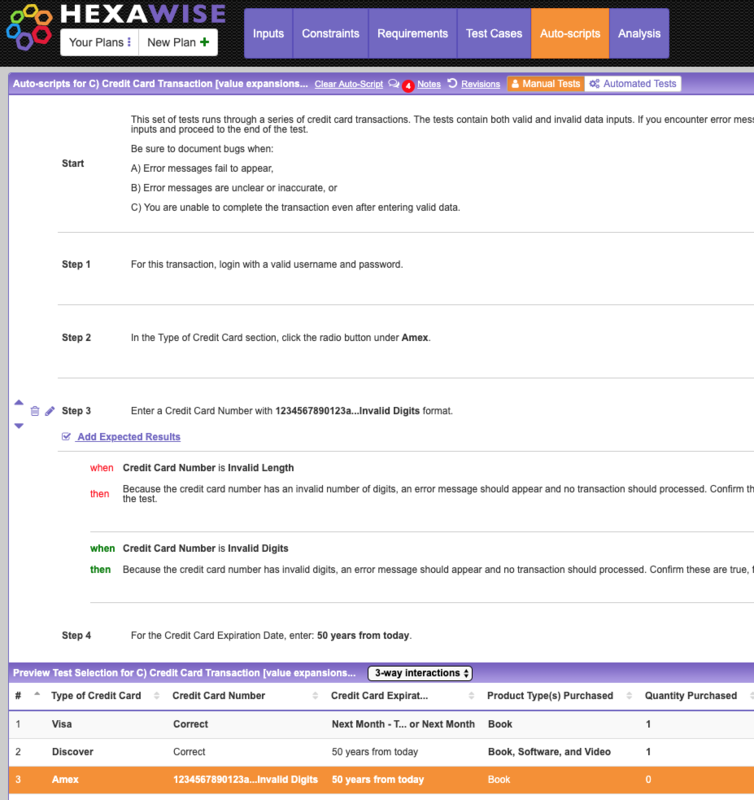 In testing the credit card checkout functionality, there are five different test conditions included in each test scenario. Even in this over-simplified example, there are close to 1,000 possible scenarios. In this context, we want to test this credit card functionality relatively thoroughly - with a manageable number of tests. We know that testing each item in our system once is not sufficient; we know that interactions between the different things in our system(such as a particular credit rating range interacting with a specific type of property, for example) could well cause problems. Similarly, we know that the written requirements document will be incomplete and will not identify all of those potentially troublesome interactions for us. As thoughtful test designers, we want to be smart and systematic about testing for potential problems caused by interactions without going off the deep end and trying to test every possible combination. Value Expansions - How can I maximize variation without increasing the number of my tests? Equivalence Classes, with particular focus on Value Expansions, are use in this plan. Value Expansions are a great way to incorporate equivalence classes in your plan without increasing the number of tests generated. It is worth pointing out that there are several strategies for including equivalence classes in your test plans. The choice of strategy used has subtle impacts on how the tests are created and written. Second Strategy - Value Ranges: For Quantity Purchased, one value is 5 - 10. When using this value, Hexawise will choose a number between 5 and 10, but first chooses the upper and lower limits (providing boundary testing) and will then at random choose other values from the range. Hexawise will even let you specify decimal value length. 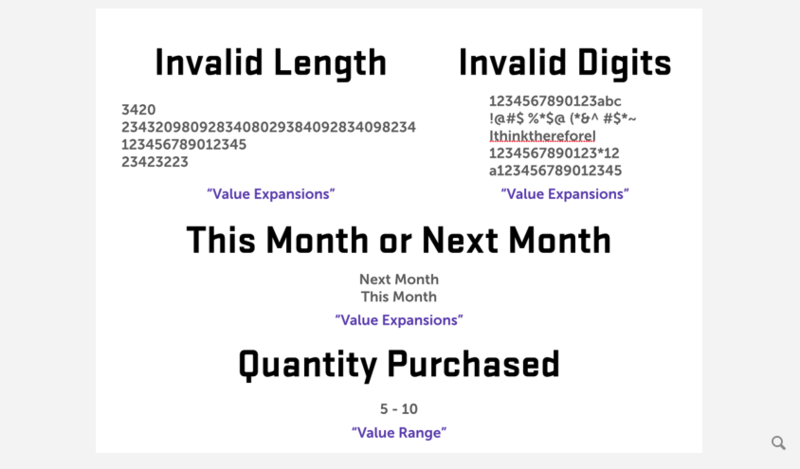 Third Strategy - Descriptive Terms with Pre-Defined Values (used for Invalid Length, Invalid Digits, and also in This Month or Next Month) - Use Value Expansions to assign specific numbers for each range. 1st - General Descriptive Terms - This strategy will result in tester instructions like: enter a high income... Potential disadvantage: is this enough guidance for testers who might execute the tests later? 2nd - Value Ranges - Using this strategy works well when you have equivalence classes defined by numerical ranges. If there are different rules for small loans than large loans, and small loans are defined as loans of anywhere between 10,000 and 99,999, you can enter 10,000 - 99,999. The Hexawise algorithm is smart enough to generate tests for you that automatically cover the valid boundary values in your ranges (e.g., highest and lowest values as well as values randomly selected from inside the range). Designing powerful software tests requires that people to think carefully about potential inputs into the system being tested. And how those potential inputs might impact the behavior of the system. As described in this blog post, we strongly encourage test designers to start with a verb an a noun to frame a sensible scope for a set of tests and then ask the "newspaper reporter" questions of who?, what? when? where? why? how? and how many? How many items can someone buy? How far in the future do Credit Cards typically expire? When is (what time of day) the purchase made? What kind/type of credit cards are accepted? What sort of items can be purchased? Asking the newspaper questions described above is useful to understand potential ways the system under test might behave. Once we have decided which inputs are important enough to include in this model (and excluded things - like 'What time of day is the purchase made?' - that will not impact how the system being tested operates), Hexawise makes it quick and easy to systematically create powerful tests that will allow us to maximize our test execution efficiency. The coverage achieved in the 23 tests above is known as pairwise testing coverage (or 2-way interaction coverage). 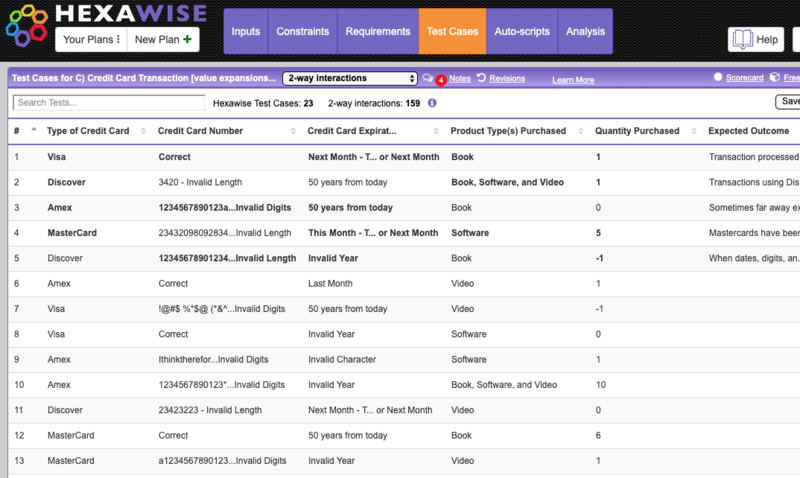 Hexawise-generated pairwise tests have been proven in many contexts and types of testing to deliver large thoroughness and efficiency benefits compared to sets of hand-selected scenarios. 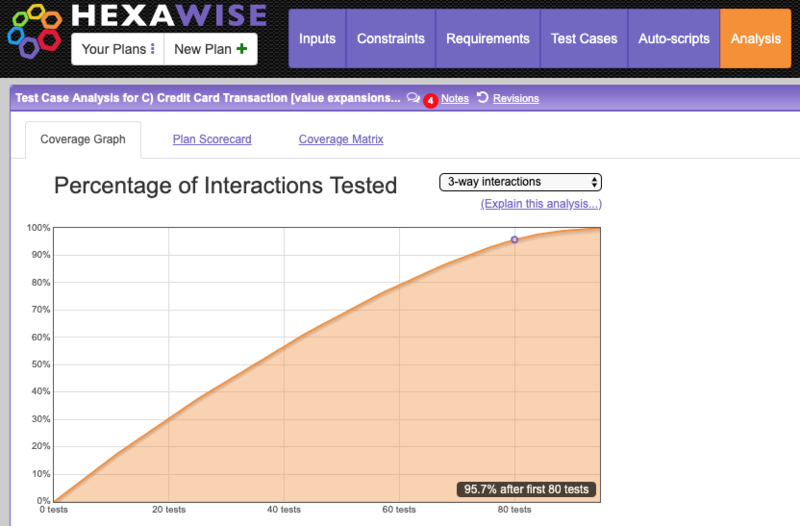 Hexawise gives test designers control over how thorough they want their testing coverage to be. As in this case, Hexawise allows testers to quickly generate dozens, hundreds, or thousands of tests using Hexawise's "coverage dial." If you have very little time for test execution, you would find those 23 pairwise tests to be dramatically more thorough than a similar number of tests you might select by hand. If you had a lot more time for testing, you could quickly generate a set of even more thorough 3-way tests (as shown in the screen shot immediately below). Hexawise generates and displays this extremely thorough set of 95 three-way tests to you within a few seconds. This set of 3-way coverage strength tests would be dramatically more thorough than typical sets of manually selected test scenarios typically used by large global firms when they test their systems. 2nd type - Extraordinarily unusual defects that would be triggered if and only if 4 or more specific test conditions all appeared together in the same scenario. 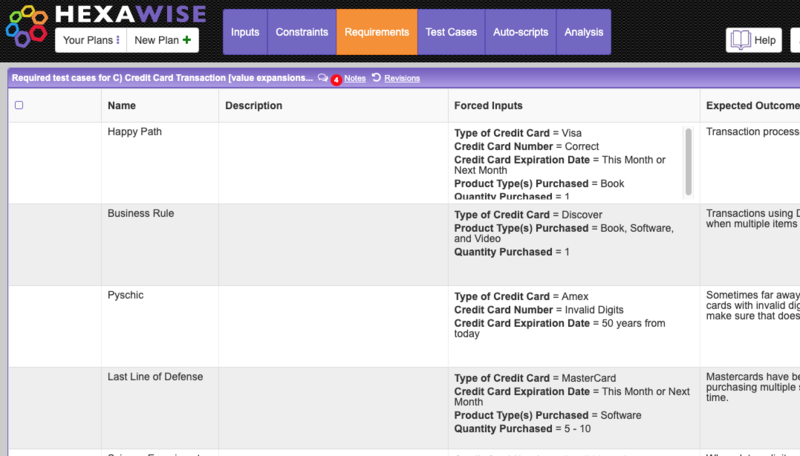 E.g., if the only way a defect occurred was if a transaction was for (i) Discover card and a (ii) Correct credit card numbers, with an expiration of (iii) This Month, and they purchased a (iv) book. It is extremely rare for defects to require 4 or more specific test inputs to appear together. Many testers test software for years without seeing such a defect. More details are available here. Finally, unlike the Hexawise-generated tests which systematically minimize wasteful repetition, many of the tester's hand-selected scenarios would probably be highly repetitive from one test to the next; that wasteful repetition would result in lots of wasted effort in the test execution phase. You'll notice from the screen shots of 2-way tests and 3-way tests shown above that some of the Values in both sets of tests are bolded. Those bolded Values are the Values we "forced" Hexawise to include by using this feature. We document a single test script in detail from the beginning to end. As we do so, we indicate where our variables (such as, "Type of Credit Card," and "Credit Card Number," and "Credit Card Expiration Date") are in each sentence. That's it. 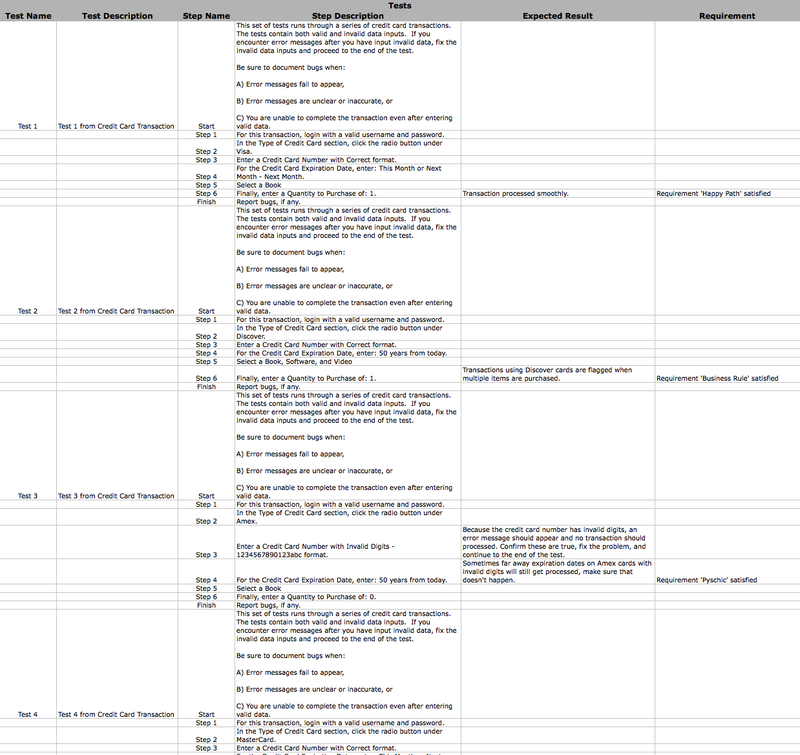 As soon as we document a single test in this way, we're ready to export every one of our tests. If you describe Expected Results like the one above on the "Auto-Scripts" screen, Hexawise will automatically add Expected Results into every applicable test step in every applicable test in your plan. As we entered this Expected Result, every test in this plan that has 'Invalid Length' will show this Expected Result after test step 3. After executing the first 15 tests of this plan's 2-way set of tests, 80.6% of all possible "pairs" of Values that exist within the system will have been tested together. After all 23 tests, every possible "pair" of Values in the system will have been tested together (100% coverage). This chart, and the additional charts shown below, provide teams with insights about "how much testing is enough?" And they clearly show that the amount of learning / amount of coverage that would be gained from executing the tests at the beginning of test sets is much higher than the the learning and coverage gained by executing those tests toward the end of the test set. As explained here, this type of "diminishing marginal return" is very often the case with scientifically optimized test sets such as these. We know we would achieve 81% coverage of the pairs in the system if we stopped testing after test number 15, but which specific coverage gaps would exist at that point? See the matrix chart below for that information. The matrix chart above shows every specific pair of values that would not yet tested together if we were to stop testing after test number 15. 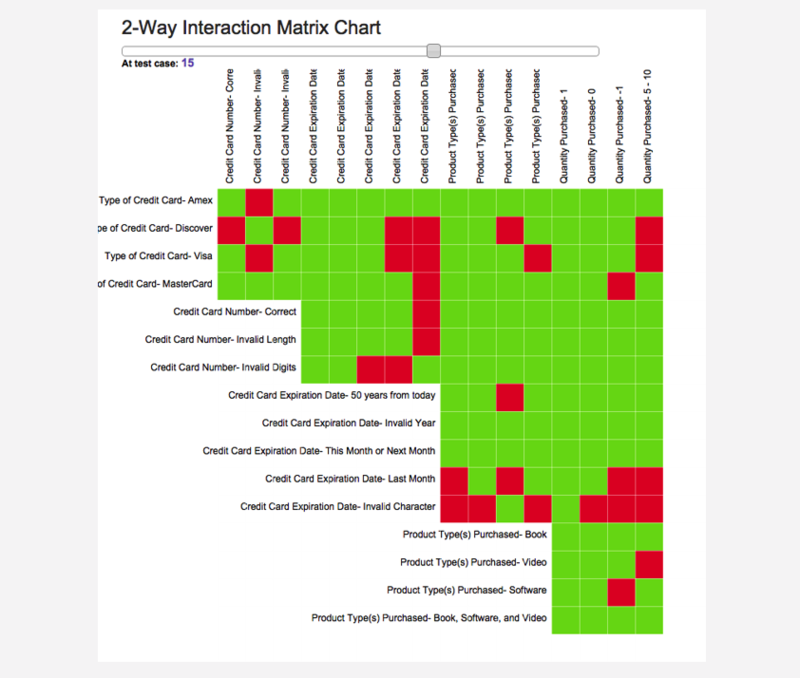 For example, in the first 15 tests, there is no scenario that includes both (a) "Type of Credit Card - Discover" together with (b) "Credit Card Number - Correct." We can analyze coverage on the extremely thorough set of 3-way tests we created also. After executing the first 61 tests of this plan's 3-way set of tests, 80.3% of all possible "triplets" of Values that exist within the system will have been tested together. After all 95 tests, every possible "triplet" of Values in the system will have been tested together (100% 3-way coverage). 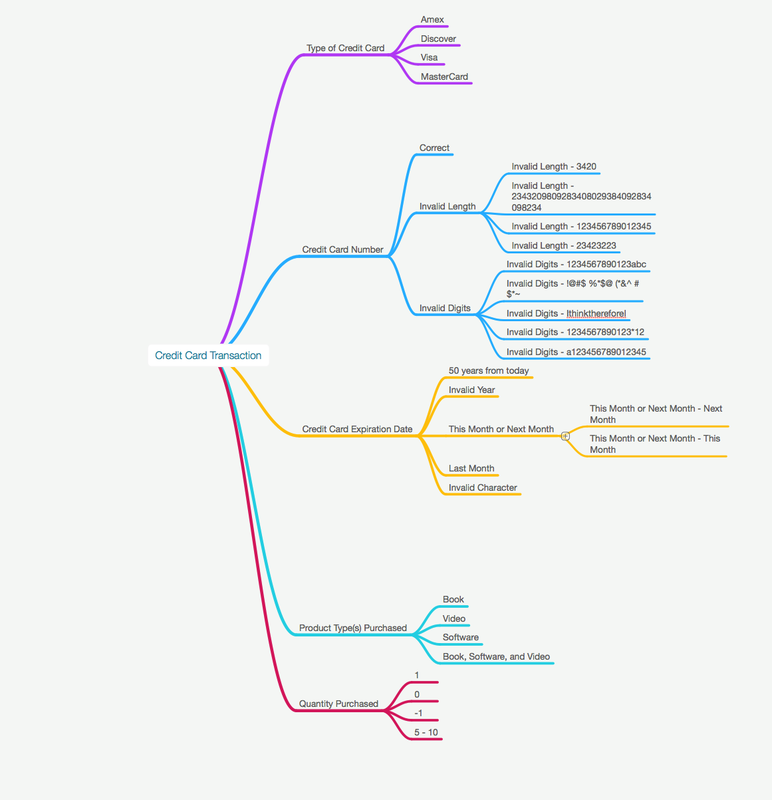 This chart provides teams with insights about "how much testing is enough?" And it clearly shows that the amount of learning / amount of coverage that would be gained from executing the tests at the beginning of the test set is much higher than the the learning and coverage gained by executing those tests toward the end of the test set. As explained here, this type of "diminishing marginal return" is very often the case with scientifically optimized test sets such as these.